In our Engaging Millennials blog series, we've explored how this generation is re-shaping various industries, and what brands can do to improve engagement among their younger customers. This edition of Engaging Millennials is the final post in our series, and today we are talking about CPG brands. Throughout this series, we've noted Millennials' increasing buying power and the reasons why brands across all industries should care about this generation's expectations and preferences. That importance holds true for CPG brands as well, with Millennials expected to spend $65 billion on CPG products over the next decade. But the 2.8 billion Millennial consumers don't have the same shopping style as older generations, which can cause challenges for the ways CPG brands try to engage them. This generation of consumers is placing higher importance on brands that have commitments to sustainability and corporate social responsibility (CSR). More than 90% of Millennials say they would switch brands to one that is connected to a good cause. Millennials are environmentally conscious and want the brands they are purchasing to share stories on what CSR efforts they are making. Unlike other generations, Millennials are likely to research new products online before going shopping. Discovery isn't occurring in the aisles, but through digital channels. 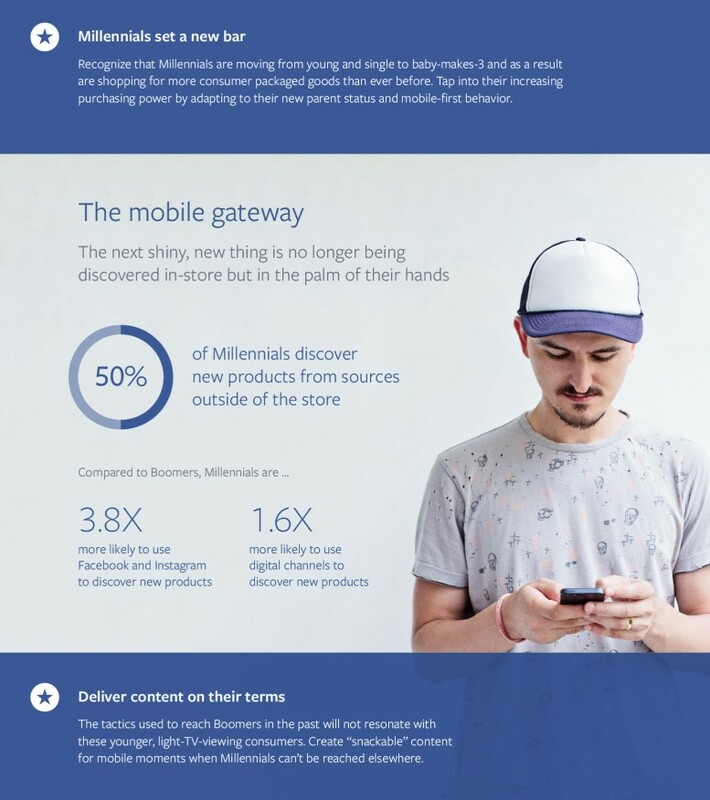 Half of Millennials discover new products from outside the store. See the comparisons between this generation and Boomers when it comes to discovery in the graphic below. It's been a recurring theme in this blog series: Millennials and mobile. More than three-quarters of Millennials (77%) have their mobile device on them at all times. As they've grown up with the rise of technology, they've grown accustomed to using their mobile device in some way for every task. Because Millennials aren't discovering new CPG products in the store aisle, engaging them requires consistent omni-channel experiences. Whether they are on your website, utilizing self-service, calling your 1-800 number or speaking with a customer service associate in the store, that customer data needs to be centrally stored, giving you the best opportunity to create connected, personalized interactions. Self-service must go beyond the website. As we have seen, Millennials are inseparable from their mobile devices -- which means your service must be mobile-friendly. Nine out of 10 consumers expect a company to offer self-service, and two-thirds prefer brands that offer it on mobile. When it comes to CPG, and today's ingredient-conscious shoppers, they need to have easy access to find the answers they are looking for. CPG brands should integrate a unified knowledgebase to power self-service across all channels. This ensures that customer interactions are consistent and that they are receiving accurate information. One wrong answer about a product's ingredients could set off a crisis-level event. Astute's CRM, ePowerCenter, integrates all communication channels into a single interface, maximizing the opportunity to personalize service to each customer. ePowerCenter also guides service agents through every customer interaction. Astute Knowledge, our unified knowledge management system, ensures that your customers are getting the right answer every time. The KMS pulls from pre-approved internal and external sources, making it easier to keep it up-to-date with any regulatory changes. Power your self-service offerings with the award-winning Astute Bot, our conversational concierge. Astute Bot delivers sophisticated customer interactions wherever your customers are -- through your website, your branded app, and popular messaging apps. Using connections to your CRM and other systems, Astute Bot can tailor every response to the individual customer. Learn how Astute Solutions can reduce risk and unify customer experiences for your brand. Case Study: McCormick & Co.